Boring? Heh….if you say so. For a lot of new people, getting past the “no more meat” thing seems to be the hardest part. So wait till they get a load of this seitan meatloaf. 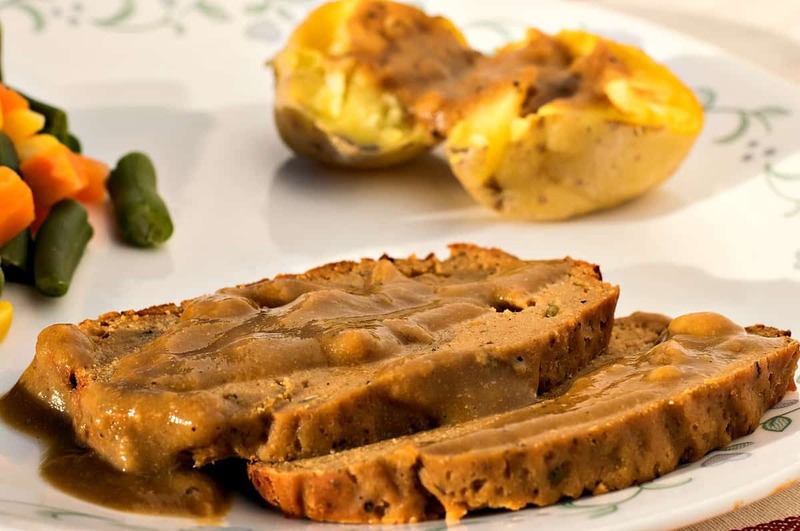 Sliced up thin on a sandwich with all the fixings, or sliced up thick and smothered with homemade gravy, THIS meatloaf will have them coming back for more. The cool thing about Seitan is, you can make it taste any way you want. I can make it taste like chicken, bbq, sausage, or even meatloaf. It just depends on the spices you add. Seitan itself is just like a dough, made from wheat gluten. Seriously you’d swear you were making pizza dough. You mix it up, knead it a few minutes, and then toss it in the oven. Nothing could be easier. You will need some Vital Wheat Gluten. This is the ‘flour’ that makes the dough. It’s basically wheat flour that has all the starch removed. I had to go to Whole Foods to find it, but it’s also available on Amazon. I’ll post a photo and link here if you’d like to buy online, just remember these are affiliate links and I do make a penny or two when you buy through my links. You’ll need two bowls for this recipe, one large bowl for all your dry ingredients, and a smaller bowl for your wet. Mix each group of ingredients separately and then combine the two in the largest bowl. It will mix like a spongey dough, just keep mixing until all the dry ingredients have become moistened and incorporated into the dough. Dump out your dough onto your work surface (no need to flour first) and give it a quick knead. I just smash it down in the middle and then fold it into itself from the edges. Do this for about 3-4 minutes. The gluten will make it really stretchy and elastic-like, which is what you want. When you’re done kneading, let it rest for about 5 minutes and then prepare your foil and containers for cooking. 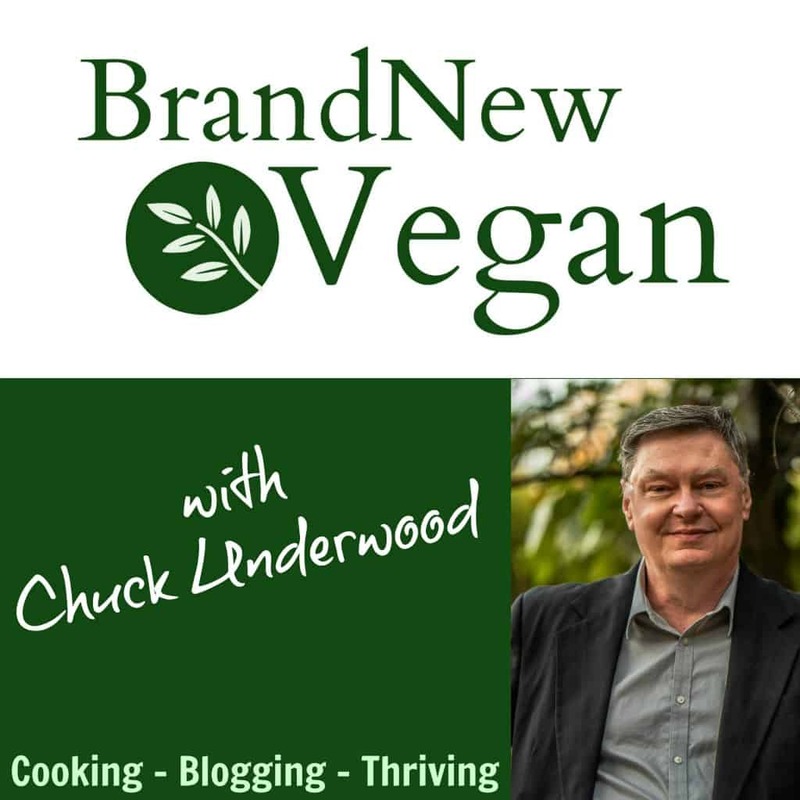 You can get different textures depending on how you cook your Seitan. For my Italian Sausage Recipe. I wrapped them up in foil like tootsie rolls and steamed them in my rice cooker. With this recipe I’m simply baking it, which I like even better. And I used a loaf pan lined with parchment paper AND foil. It gave it that typical meatloaf shape when it was done. No muss no fuss and it came out great. Line a loaf pan with foil, then with parchment paper, and add your seitan dough. Using your fingers, squish it all down until it is evenly distributed and then bring the foil and paper up over the top to seal. Bake in a 325 degree oven for about 90 minutes. Peel back the foil and paper during the last 5-10 minutes to allow a crust to form on top. It’s also a good time to slather on some Ketchup, for those of you who like your meatloaf that way. From reading your Facebook comments, I know that many of you have stubborn “I have to have meat” types at home. It is my hope that these recipes will allow them to see we can still have ‘meat-like meals’ full of texture and flavor, without all the artery clogging grease, saturated fat, and cholesterol we know is so bad for us. Love the comments – I do read them, so keep them coming! 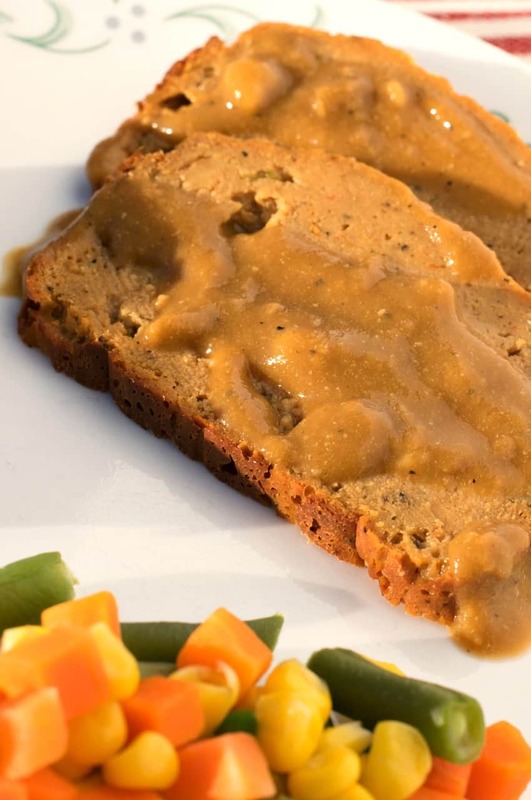 A meat lovers Seitan Meatloaf - without all the meat. Same great texture and flavor without the saturated fat and cholesterol we know is so bad for us. Perfect smothered in gravy or sliced into sandwiches. Line a loaf pan with aluminum foil, and then parchment paper. Add seitan, smashing down until evenly distributed. Fold over parchment and then the foil to seal. Set oven timer for 90 minutes and place meatloaf in oven. 5-10 minutes before the timer goes off - remove the loaf from the oven and remove the top piece of foil and parchment paper, exposing the top of the meat loaf. Brush with ketchup if desired. Continue baking for another 5-10 minutes. If you live near a WinCo store you can find gluten flour in the bulk foods section. It is hiigh quality and works well in seitan recipes. Does the pan have to be lined with aluminum foil or can I just use my silicone loaf pan and cover with foil? No,I think that would work just fine. What is chile garlic paste? Is chile the name brand? It’s a spicy mix of Asian Chilies and Garlic. Usually located in the Asian Section of your grocery store near the Soy Sauce and Sriracha. Thank you Chuck. It was called Chili Garlic Sauce. Appreciate it. This was the best! I loved the spicy taste in it as well as the meaty texture. I missed having meatloaf cold sandwiches, and this recipe satisfied that craving. Thank you! Hi Chuck! Have you tried making ‘meatballs’ out of this mixture? I wonder how long they would have to bake, and if they’d hold up to simmering in marinara sauce!! Although I haven’t tried this particular recipe, I find that a similar recipe mixed with whole wheat panko bread crumbs makes a great meatball. The panko makes it less dense. You may want a more italian spice mix also. I bake in the oven and then freeze. I am gentle when they are cooking in sauce, but yes they hold together well. Another way to reduce density is to add some food processor chopped mushrooms. That’s my favorite for sausages and hotdogs. This is genius!!!!! I only have one thing to say……THANK YOU CHUCK!!!!! I just made this and just tasted it…..this made my whole home smell out of this world…not to mention the texture, the taste is amazing….I can’t wait to try it cold!!!!! Did it have a distinct tomato taste to it? I want to try this, but am thinking of substituting one or both of the tomato based ingredients with something like A1 steak sauce or brown gravy because I’m not a fan of tomato sauces. Does this have a tomato taste to it? If so, is there anything I can use to substitute one or both of the tomato based ingredients? Like A1 steak sauce or brown gravy instead of ketchup? I’m not a fan of tomato based sauces and it’s really hard to find meatloaf recipes (even meat ones) without them. So I tried out this recipe and it was great. Even my mom and grandma, who aren’t big on meat substitutes, loved it. I didn’t have nutritional yeast, so I substituted it with some vegan parmesan. I also substituted the ketchup with 1/4 cup of mushroom gravy (the recipe linked early on this page, it’s delicious too). It came out absolutely delicious. I ordered some nutritional yeast and plan to make this again so a friend can try it out. Thanks, just made it, came out just as in the photo. Was a hit with the wife, along with mashed potatoes and homemade (vegan) gravy. Hopefully my husband will love this! Hi, just made this. Came out fine except the tinfoil really stuck to the sides and bottom…a mess in cutting it off. I guess using something like Pam is in order? I’ve had that happen too. Maybe some parchment paper between the meatloaf and the foil? they have non stick foil, I use it to make my oven french fries, it works great, most grocery stores have it. my husband is anti vegan…but maybe he’ll try this. hmmm…maybe i won’t tell him it’s vegan! This loaf was amazing! Made it for thanksgiving yesterday and was so happy with how easy it was, and how delicious it came out! I didn’t want to go looking around for the vegan thanksgiving roasts, so I wanted to make something simple that was similar, and this nailed it! Instead of tomato paste I used fermented chile paste, and used aura ha instead of garlic chile paste. Had a bit of spice to it and was perfect. Thank you for this recipe! Has anyone made this one day and baked it the next day? Another great recipe! Thanks for such an easy and delicious concoction, Chuck! I’ve made A LOT of vegan meatloaves and this was by far the best one yet. I don’t know if people are just not following your recipe as written, but I was shocked at how much flavor it had. I’ve pretty much given up on roasts and meatloaves, but this is a new favorite up there with our store bought celebration roast. I will say that after 90 minutes ours was still a little undercooked on the top-middle, but those pieces I just put in the microwave for two minutes and they firmed up. Thank you so much! I want to curse so badly! This was %^%#^@$#@% amazing! I don’t think there are enough expletives to describe how content I was to sink my teeth into this. Followed your recipe to the “T” and I wouldn’t change a thing. Thanks for sharing and I’ll definitely try your other recipes. 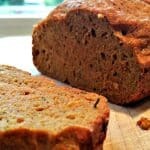 Been a vegan for quite some time (20+ years) and a wannabe cook for longer – I’ve recently been looking for decent seitan recipes and this is in my top 10. Keep up the great work!! !